A group of Millwood, Inc. team members from several locations across the country came together with residents of Fremont, NE after a storm wreaked havoc leaving nearly 600 homes uninhabitable. The group, which consisted of team members from our Apple Creek, OH; Dundee, OH; Alburtis, PA; Mechanicsburg, PA and Waterford, NY locations departed Friday, March 29 from airports and roadways across the country and met in Fremont where they stayed for one week. Click the image to view a gallery of photos from the trip. 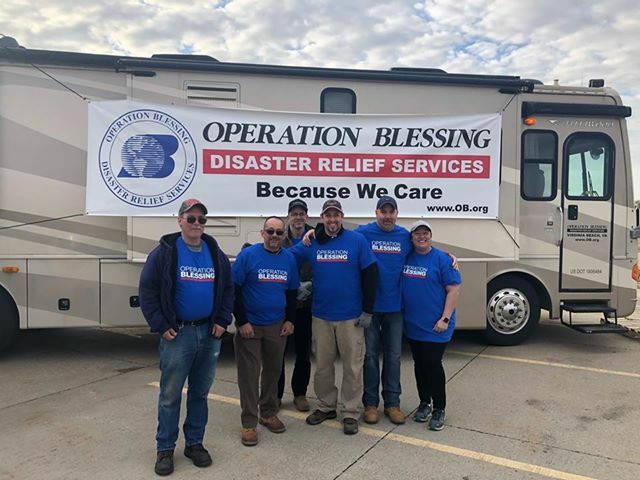 The team worked with Operation Blessing International, a nonprofit humanitarian organization, to clean mud and muck from basements, tear down drywall and build relationships with residents there in an effort to begin the rebuilding process. “Through previous stateside mission trips, we’ve established a great working relationship with the Operation Blessing team,” said Jody Jones, regional chaplain coordinator. “The work they do for so many people in need when disasters like this strike is selfless and something we at Millwood believe strongly in,” Jones added. Millwood Cares, a program that was developed to assist Millwood team members with their professional, personal and spiritual growth through four pillars – heart, mind, body and spirit, sponsored the trip. Upon arrival, they were assigned work orders – a list of homes that were in need of cleanup – for the week across the Fremont area. Jones said they completed three to five per day. Dumpsters full of debris and lost memories lined curbs and driveways as they drove to their first home. The Millwood team of volunteers finished 19 work orders before returning home on April 7.